Parisians and tourists alike have their favorite cheese shops, and commit to them with a fierce loyalty (For example, I simply adore La Fermette on Rue Montorgueil.). But a consensus for one of the city’s best — and possibly the best — is Quatrehomme, a mini-chain of fromageries founded in 1953 with its headquarters at the incomparable Quatrehomme: La Maison du Fromage on the Rue de Sevres in the 7th Arrondissement. The answer to that question largely is Marie Quatrehomme, a third-generation cheesemonger who helms the family business and who was the first woman to ever win the prestigious Meilleur Ouvrier de France (MOF) title, awarded to the nation’s best artisans and craftsmen in a wide range of fields. 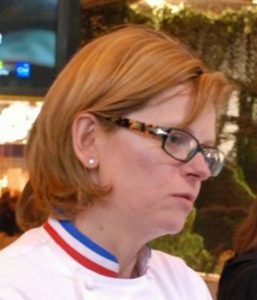 Marie received the MOF title in 2000, the first year cheesemongers were included in the competition. Specifically, Quatrehomme’s calling card is that she is an expert affineur — one who refines, or ages, cheese that is produced offsite. By working closely with cheesemakers throughout France, Quatrehomme has perfected the aging process for countless cheeses, which she finishes in her own cellars. 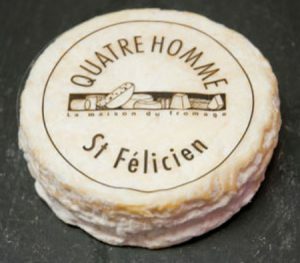 Although the aging process varies from cheese to cheese (based on temperature, humidity, the shape and size of the cheese molds, length of aging time and other variables), Quatrehomme has a particular fondness for long-term aging in cool cellars. A star product of this slow, cool refining process is a semi-hard cow’s-milk Comte produced by renowned cheesemaker Marcel Petite that is aged for three years! 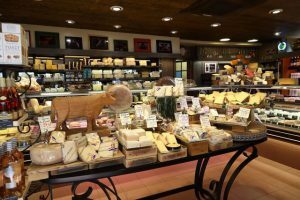 But Quatrehomme wouldn’t be such a success without the finest-quality products available, and there more than 200 cheeses to choose from that are produced in every region of France and, indeed, throughout Europe. Do you love goat cheese (chevre)? 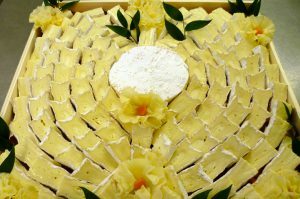 There are dozens available, including Valencay, Carre du Tarn, Le Charolais, Le Mothais sur Feuille, Le Pouligny Saint-Pierre and Selles-Sur-Cher, to name a few? Are soft cheeses your favorites? Try the L’Epoisse au Lait Cru (my favorite French cheese! 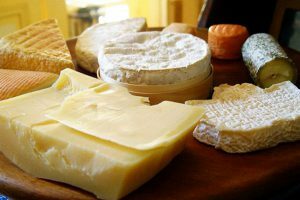 ), Le Langres, Le Livarot, Le Saint Felicien, Le Saint Marcelin, Le Camembert de Normadie or, of course, Brie de Meaux. Can’t get enough blue cheese? Opt for the Roquefort or La Fourme d’Ambert. Love a good, hard cheese? Don’t leave without at last sampling the Emmetal de Savoie, Gruyere, L’Etivaz or the Grana Padano. And then there are the house specialties, including the Mont d’Or with truffles and the Brie Double aux Noix (Brie with walnuts). And don’t be put off if the staff starts asking what seems to be a lot of personal questions — How many guests are you having? Will you be serving the cheese today or tomorrow? Will you be refrigerating the products before serving? All of these inquiries are designed to provide you with products that are perfectly ripened the very minute you plan to serve/eat them.Can’t make up your mind? Have the friendly, English-speaking staff whip up a sampler platter for you or even just choose two or three cheeses to serve your dinner guests (or, if you’re like me, simply scarf down all of it by yourself with a fresh baguette or two). Yes, even a cheese offered a few hours too soon is a serious faux pas for the cheesemongers at Quatrehomme. If you plan to take some cheese home to share with your fellow francophiles who weren’t lucky enough to make the trip to Paris, the Quatrehomme staff can help you select varieties that will travel well and, ideally, last for several days. They can even vacuum-pack cheese for you so that you can easily whisk the products through customs (unpasteurized cheese cannot legally be brought into the U.S. unless vacuum-sealed). And really, what’s a better souvenir of your visit to the City of Light than serving up delicious cheeses you can only find in France? And perhaps only at Fromagerie Quatrehomme? 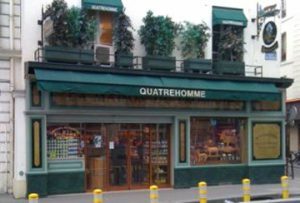 Fromagerie Quatrehomme is located at 62 Rue de Sevres, between the Vaneau and Duroc Metro stations. Hours are Tuesday-Saturday, 9 a.m.-7:30 p.m. This entry was posted in Famous Paris destinations, Food, French cuisine, French culture, Left Bank and tagged cheese, fromage, Fromagerie Quatrehomme, Marie Quatrehomme, Meilleur Ouvrier de France, MOF by Bob Adams. Bookmark the permalink.